I decided to make a Peppa Pig cake for my daughter’s 2nd birthday as she is obsessed with anything Peppa Pig related! In the past I had baked sponges but had never iced a cake before! I really wanted to make her a cake and got my ideas and advice from this website mainly along with others for technical advice (as I didn’t even know what type of icing to use for what or how to apply the icing!). I was a complete novice and did wonder if I was taking on too much! But in the end it wasn’t as hard as I thought it would be and I actually quite enjoyed making it. I baked 2 x 12 inch square Victoria sponges, so I wouldn’t have to cut it in half to put the filling in. I read Madeira is a better choice as it’s stronger to withstand the weight of the icing, but made a Victoria anyway and it was fine. As I knew time would be an issue with a toddler and a 3 month old, I made the sponge the weekend before and froze it. The day before the party I took the cake out and pinned on a template of Peppa using cocktail sticks. My template was just a picture of Peppa pig from the Internet printed and enlarged. I cut the templates into parts to get more out of the cake. I had 4 parts – head, body, crown and wings. I cut around the templates while it was semi thawed. Next I sandwiched the cake together with strawberry jam and buttercream. Then I used regal ice (ready coloured fondant) for the crown and the eyes so I didn’t have to make up black or yellow myself. I used Dr Oetker’s ready to roll White icing for the wings and eyes, I also used it for Peppa’s head, body, arms, legs and wand and coloured it myself with a claret colour paste. With this colour you can mix up all the shades of pink you need. For quickness you could buy the colours already done for you. In total I had to make 4 pinks. Lightest pink for the skin colour, next shade of pink to line the edge of the face, eyes and nose (fondant rolled into sausages) and used this colour for the cheek.the 3rd shade was for the dress, smile and nostrils and the darkest to line the dress. All rolled out icing was attached to the sponge by first brushing cooled boiled jam to keep the icing from slipping. The icing, such as the edges, eyes, cheek etc I attached just by wetting the icing with a little water. Finally I Fixed the section together with a stiff glace icing mixture. I decorated the crown with jelly diamonds and silver balls. I used a jelly diamond on the wand and used baby pink edible glitter on the wings, wand and crown. I later cut out a number 2 and attached to the dress and used the colour paste to colour some icing to pipe out happy birthday. My daughter loved it and everyone at the party commented on it too! Definitely worth the effort and it tasted great! 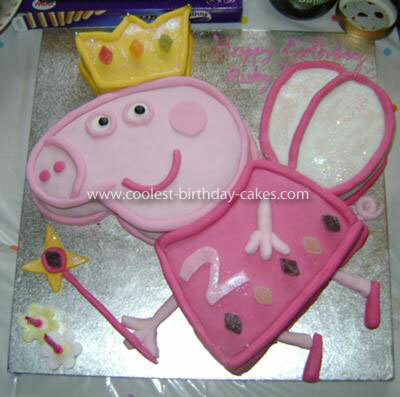 Birthday cake idea posted by Natalie M.
Absolutly brilliant cake…i’m actually going to print this off and follow it for my daughters 3rd bday cake….she has been saying for weeks its a princess peppa cake she wants!! No of course I don’t mind! That’s such a compliment thank you! I got a lot of my ideas from this website too! You’ve made my day! My daughter is 3 in a few weeks and this is fab, she loves Peppa Pig & also thinks she is a fairy princess – both boxes ticked! Totally amazing will definitely give this a go! I’m going to try to follow it too, I have a 4 month old and my daughter will be 2 tomorrow, cakes thawing as I type! Will see if I can get it anywhere near as professional looking! Well done! Thanks for sharing your brilliant cake. I have just made my own and thanks to your instructions it’s turned out really well. That’s really good to know thank you! Just had to write a little note to compliment you on such a fantastic cake! I am going to attempt to make one for my little girls 2nd birthday party. If it turns out to be half as good as yours I will be chuffed! Well done! Hi, what a lovely cake. I took inspiration from you as not baked for years but will try out for my daughters 3rd bday party! Just wanted to ask is 250g of each colour fondant icing enough? I never used fondant icing before but will give a try! What a great Peppa pig cake!My newphew announced a few weeks ago that aunty rose (me) was going to make a peppa pig cake (he,ll be 3).im going to give it a go! Thanks for sharing it with us you did a great job. does anyone know where i can find a template to make this cake from? ?